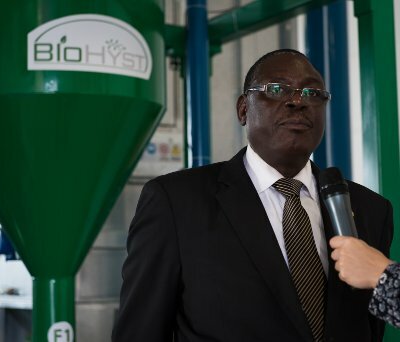 On October 4th, 2014, The Burkina Faso Government, following an official letter of interest in the project Bits of Future: Food for All, sent a delegation to Balerna (Switzerland) to start testing the Hyst process on local biomass. The delegation was led by the Minister of Agriculture and Food Security, followed by Mr Saga Pascal Ilboudo (Special Secretary of the Agricultural Policies Management) and by Mrs Aoua Toure Sako (Firs Counsellor at the Rome Embassy). During the demonstration sorghum and water hyacinth were processed with the HYST. Minister Zoungrana was enthusiast about the HYST potential which: “would allow us to use many residues from our crops. Corn harvest residues come to my mind immediately, they could be used to produce food“. Thus corn harvest residues will be tested in the near future: the next concrete step to start a project in Burkina Faso as soon as possible. “We saw the opportunity to realize integrated installations which will put to use waste products bad for the environment and more” said the Minister. “It will be possible to utilize pest plants, such as water hyacinth which is becoming a problem for our streams. This is an extremely important invention for a Country like ours: it puts to use waste products bad for the environment, it transforms them into food for human and animal consumption, but it can also utilize these residues to produce energy“. Minister Zoungrana congratulated the Hyst technicians and also said: “I want to express my country’s desire to benefit from this technology. It is a technology of the future which can enhance food security in our Country“.